I took a break from my Sunday routine of late (getting into the Studio one more time before the work week comes around again) to attend the dedication for the new mural on the north side of the Boatworks. Unlike last year's effort on the south side, I had very little to do with this one. Painted one small section one evening and that was it. I would have been happy to do more, but my work schedule didn't give me much free time when the mural crew was busy. My lack of participation didn't hurt much, as they did a great job and got it done in time for a September dedication. 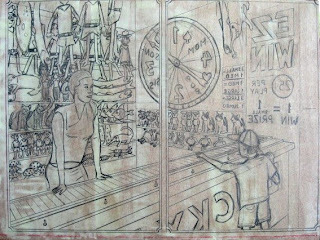 I was told that the idea to include the art historical based figures on the far left came from the musicians and dancers idea I had pitched for last year's mural, so I guess I contributed that way. 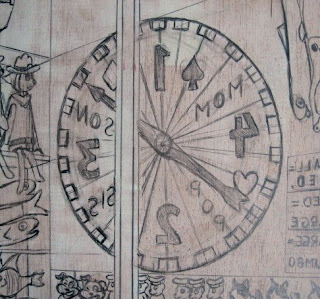 As part of the dedication there was a pot luck picnic, live music, and fish printing organized by Sandy Taylor, a longtime friend of the Studio. 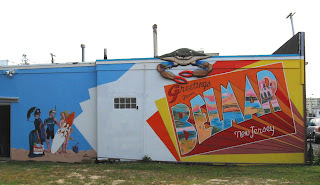 Photos of all the festivities can be found here on the Belmar Arts Council blog. Spent a few more hours working on my new block today. I had brought it home with me last weekend, so I could spend some time with it, and those observations gave me a head start in the Studio today. Did a little fixing of the thin vertical strip at the far right. 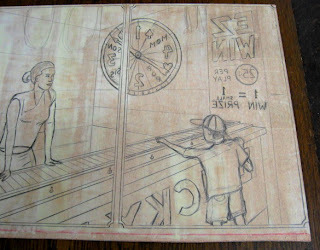 Redrew the boardwalk boards to make it lay more like it should. 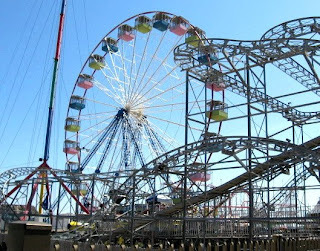 A few adjustments to the figure and the ferris wheel, and improved the building seen between the two. Underneath the shelves with the toys in both panels there had been an empty space, which had been blank wall. After considering it over the past several days, I decided to put something in those places, large cardboard boxes in space created under the shelves, some partially open revealing contents. 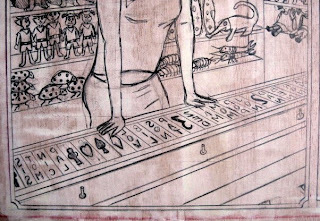 On the shelves themselves I indicated some shading on the back walls, and showed some texture on the desmans, the odd critters with the long snouts and tails. (click the photo to see all these details) Part of this is the influence of Molly, who pointed out how my black and white pieces have more textures, an effect of having to achieve my gray tones optically. My first significant color series was the saint series, which made more use of marks in the color areas, giving them a more graphic quality than the more recent Ecclesiastes series, where sometimes the use of the watercolor is more painterly. I think the more graphic approach would fit better with this series. The last major thing I have left to deal with is the relatively empty area around the wheel. It doesn't need to be as busy as the other areas, but I think it needs something. More likely surface decoration on the wall than more objects. Left the block there today, but I'll continue to think about it, and maybe seek some feedback from the crit group this coming week. The beginning of the school year brings a welcome increase in my income, but with it comes a lot less time to spend in the Studio. I got there today, but first I had to deal with a school related task. Yesterday on my way home from class I stopped off in Brick and bought a piece of plywood. 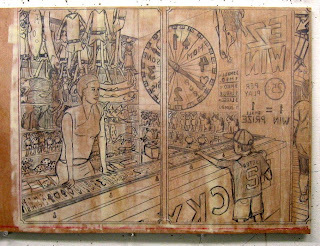 Today I cut it into a pile of 8"x6" boards that will be distributed to my 2D classes in a couple of weeks for their woodcut project. Not a difficult task, but glad to get it out of the way. After the Giants game I spent a little more time on the current block. Put more names on the game board, now on the right side panel. Also put these names on the wheel, though at that size the letters may only be suggestions when cut. I also started working on something for the thin vertical strip on the far right. 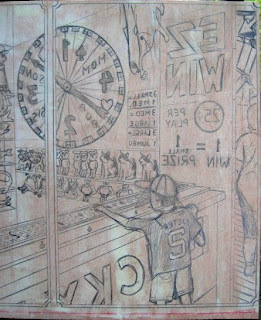 In this first attempt, I have most of a figure (based on one of my many boardwalk photos from the past year), and bits of architecture- a sign, a ferris wheel, and an unspecified building. I come back to it in a few days and see if it need tweaking, or to be completely replaced. Last couple of days, wherever I turn, I see stories about Damien Hirst. I would imagine anyone who reads an art blog would know who he is, but if not, he's part of the art world, gaining fame as part of the Young British Artist movement in the 90's. Not that he made anything that most people would consider art. He's best known for display cases with dead animals, some preserved in formaldehyde, some left to rot. Last year he commissioned a diamond encrusted cast platinum skull that was priced at $100 million. And he has a Warhol style factory that produces various products like spin art and dot paintings. (Hirst admits that he lacks the skill to paint the dots himself.) What's most amazing about this is that somehow he has convinced significant numbers of critics and collectors that he's actually an artist, and that his work is worth collecting at outrageous sums of money. 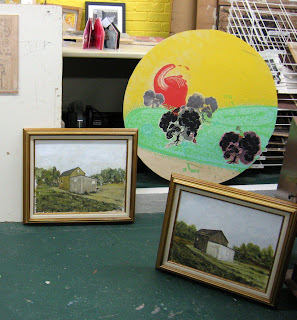 The event that sparked the recent press coverage (NY Times yesterday, CBS today) was his recent decision to bypass his gallery/dealer with his latest batch of new work and to sell it directly to collectors at a major auction house earlier this week. The commission that auction houses take is usually far less than what galleries demand, which makes a difference when the 223 works bring in a total of $200 million. The CBS story mentioned something interesting- his own gallery, who he had cut out of the profit loop in this auction, was there spending many millions to buy some items, and bidding up many others. 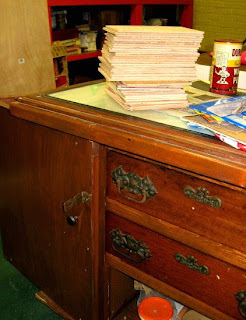 This was mostly an effort to keep up the value of unsold work of his they had in stock. And it would not be surprising if other Hirst collectors were there for the same purpose. So what we had here was less an art auction than a commodities trading session. Really no different from the speculative bubble that shot oil prices to record highs over the past year. Well, unlike the gasoline prices we've all suffered, at least the only people who will be hurt by this bubble are the fools who spent the money on these Hirst products. By the way, if anyone reading this has millions of dollars to spend on art, and was outbid in the Hirst auction, drop me a line. I've got plenty of inventory of my own work available, and you won't have to worry about where you will store a rotting carcass. With the disc on its way to Iowa, I could get back to working on my current block. Today was adding some details and making adjustments. The first 3 photos above show some particular areas that I worked on. I put some of the space names on the game board. In addition to the large numbers and card suits, the most common designation for the various spots on these wheels are three letter names, or shortened names. 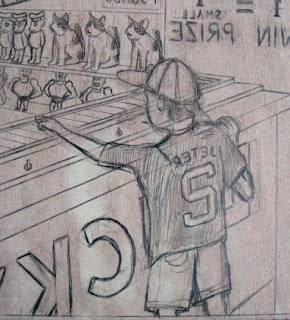 On the other side of the block I chose a design for the kid's shirt, making him a Derek Jeter fan, very common around these parts. (I know it looks like a 5, but when reversed in printing this will be a 2.) I also started cleaning up the wheel itself, though some further detail will be added. The last photo shows the whole block. More to go, but that will have to wait until tomorrow. The lack of news over the last week is a result of devoting much of my spare time (what little exists around my 3 jobs) to preparations for the upcoming show in Iowa. 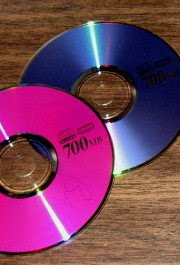 My contact had requested a disc with images, to use for a postcard, etc. It took a couple of tries (one disc developed a problem), but I finally got it done and out in today's mail, along with an explanation of the various files on the thing. Many steps to go between now and November, but at least this one is done. Went to the Studio earlier than usual today, so I could get back in time for the Giants game. 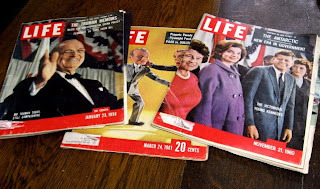 Before doing any drawing, I spent some time looking though some old Life magazines. Life has always been a good source for details, and occasionally inspiration, especially the late 1950's and early 1960's. The ads, not the articles. To me, many of the consumer products of that era look more like the things they are than today's versions of those things. Also, I think it takes things out of the present and allows them to be seen as anytime in the last half century. What got me thinking about Life was a desire to throw in some corporate inspired characters, which sometimes make the jump to toys. I had two in mind from ads I had set aside in a reference pile more than a decade ago. Both for ice cream, both for dolls that were available at a discount with a minimum purchase. They can be found on the lowest shelf on the right. Looking though the issues I brought today gave me two more, on the shelf above- a dog based on a pet food logo, and an early precursor to today's Sugar Bear character. The little muscle man next to the dolls was based on a character on an ancient putty mix container I had in the Studio. 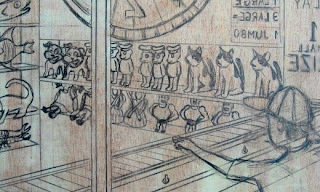 Last but not least, I put in a couple of cats- a white with black markings with the other small animals on the right, and a black cat on a medium shelf just to the left of the game attendant's shoulder. (the latter replacing some hatchet fish I drew yesterday that I didn't think were working) The two cats are based on two I know well, my parents' cats, who end up in my care now and again. 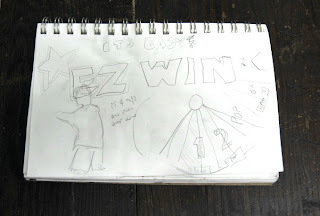 I think that takes care of the prizes, though I will be a while before I'm ready to start cutting, so something could change. There are still more details to be worked out in some of the areas already started, as well as the vertical strip on the far right. 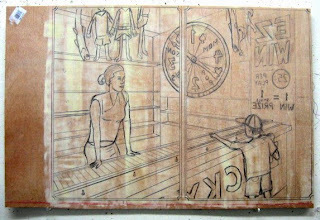 Back to the Studio for a while this afternoon to continue on the latest block. Today's effort was concentrated on the left side panel, filling in more of the stuffed animals. I put in the large, medium, and small prizes. 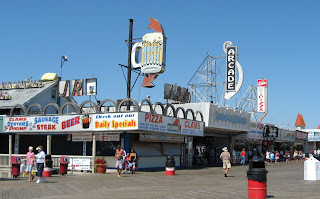 On my trips to the boardwalk this summer I was making note of the typical prizes, and based mine on the ideas. Of course, most of the things I came up with aren't ones you're likely to see as actual prizes any time soon. One common prize is stuffed versions of popular cartoon characters. I chose some of the Houndcats. Maybe not so popular now- only 13 half hour episodes were created and shown on Saturday morning tv for one season in the early 70's- but at that time it was my favorite show. Thirty-five years later I had absolutely no memories of the show itself, just a board game missing everything but the board. But thanks to the internet I found some video clips, used them as a source. Used two of the characters, Stutz and Ding Dong, who can be found here in jumbo, large, and small sizes. Boardwalk prizes often reflect popular culture, so I decided to make something celebrity related. Since I normally try to avoid all "news" about celebrities, I needed to do a little research. Watched a tabloid style show, which included a piece about Paris Hilton buying art supplies (a canvas and other stuff) at an art store that was not specifically named, but the bags were clearly from Pearl. So I guess she and I have that in common. But in the end I settled on Amy Winehouse, mostly because her distinctive hairstyle makes her easy to caricature. She's a large prize. Stuffed animals are always popular. I turned to my 20 volume wildlife encyclopedia, paging through about half of them, and selected a variety of critters, a mix of things both typical and unusual. They'll all be cute when I'm done with them. I also drew some paramecia, borrowed from Molly, who has put them to use in some of her recent projects. Various animals can be found in all 4 sizes. It certainly looks different with all those shelves filled in. Now that gap between the bottom shelf and the game board in front really stands out. Don't know yet whether I like that or not. Meanwhile, next time I'll put more toys on the other shelves to the right, and take care of more details all around. The Critique Group met in the Studio tonight, a week later than usual. (We decided to postpone it a week to get it away from the Labor Day holiday and first week of school.) Another unusual thing was that none of our regulars were there tonight, not even group founder Molly. Luckily, some new recruits chose this month to make their first appearance. I showed my current Boardwalk block, and the photos show some of the other work that was presented tonight, including Michelle's mixed media book arts, Jill's charcoal and pastel drawing, and Guido's landscape paintings. The dynamics tonight were a little different (the regulars are pretty much all friends and/or former students of Molly, while the only thing that all of tonight's participants had in common was that they knew me) but the work was good and we had plenty to talk about. And I figure there's a good chance that some of tonight's crew may become regulars themselves in future months. We expect that next time we'll be back to our usual first Wednesday schedule, so the critique group plans to meet again on October 1. 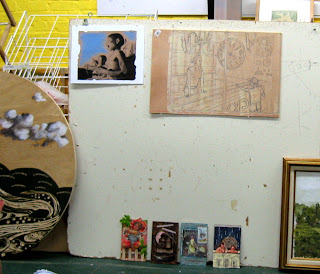 Went right to the Studio after work today, to get a little work done before the planned discussion group in the evening. Two main things worked on today. 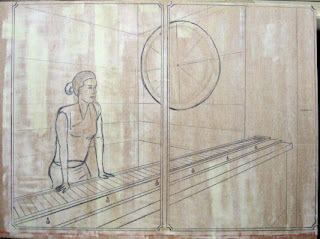 First I took the suggested shelf lines and drew the shelves in perspective exactly where they will be. Then I started the process of putting in the game prizes- jumbo stuffed animals/characters hanging from the ceiling (a point out of view). Smaller versions of these and other critters in 3 sizes will be used to fill in the shelves, but that will have to wait for another day. Put in a few hours in the Studio this afternoon, continuing work on the wheel game block. Mostly it was continuing to refine and develop areas I had started before. I made some adjustments on the boy, and started filling in signage. Also started working up the graphics on the wheel itself. I don't know that any of these areas are finished, but I think it's starting to come together. No, I'm not planning to get any tattoos in the near future. (the post title is an old joke from high school) But I did spend a few hours at a tattoo shop this afternoon. 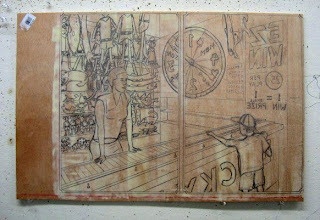 One of the ideas for my boardwalk print series has to do with getting tattoos. I'm going to save the full story until I start the block. 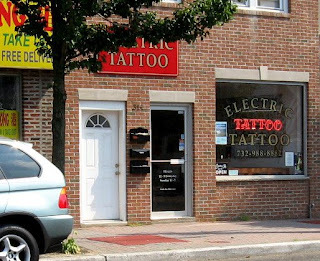 Today I was getting some references at Electric Tattoo in Bradley Beach. 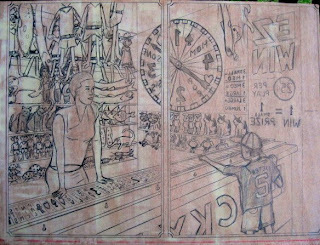 One of the co-owners is Robert Ryan, an artist who I know from his times in the Studio (as one of Molly's silk screen students and from crit nights) and from the local art scene. Knowing I could use some reference material, I dropped by his shop a few weeks ago to see if he was ok with me coming by sometime to do some sketching. He was, and suggested this particular day when he had a some scheduled appointments. 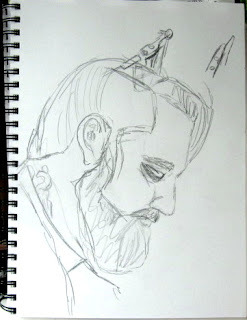 I got there shortly after the shop opened, and his first appointment was agreeable with me sketching the process. Some of the results can be seen above. After he was done with her tattoo ( a small butterfly on the lower back), I took some close up photos of his tools, as well as some of his flash on the walls. 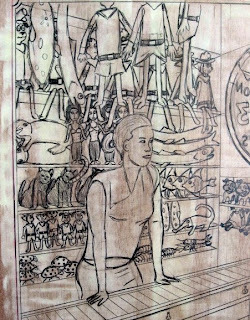 Eventually I will sit down and see how this material can be worked into a print diptych, but not before I finish the current wheel game piece, and it's possible that another one may be started next. Dropped by the Studio after work today, put in a few hours toward the new project. Most of that time was spent looking through wildlife books, seeking ideas for stuffed animal toys that will be among the things on display on the back wall. The little time I spent on the block was to start roughing in the figure of the boy, based on one of my quick gesture sketches yesterday. (see top image) It's a start, but needs a lot more work- the head is definitely too small to be of the right proportions for a child, and the rest needs a little work as well. Normally the first Wednesday of the month is our night for the Critique Group, but Molly postponed it until next week to get it out from under the holiday/first day of school pressures. I decided to hang around in case anyone didn't get the message, and one person did turn up, not sure what decision had been made. She was a little disappointed, but even happier to go home and get some rest. After that I closed up the shop and went home for the night. All are relief artists, but style and subject matter vary widely among the group. Should be an interesting show. I'll post times and dates when we get a bit closer to the show. The summer season generally ends at Labor Day, but today's weather showed that it isn't done yet. I didn't need to be at any of my jobs today, so I took care of some business in Ocean County, then took the short ride from there to the Seaside Heights. Those from NY/NJ know Seaside very well (by reputation if not experience), and those from further parts may remember MTV having their summer beach house location there a few times in the 90's. I wanted to get some more references and notes from Seaside for my Floating World project, but I hadn't been there for a few years and I was not in a hurry to deal with summer crowds. (I had been collecting them from Pt Pleasant since last year ) The place was hardly empty today, but not the usual mobs either. The ride parks were closed and a few game booths were shut down, but most games were open, as well as almost all the arcades, food stands, shops, bars, psychics, etc, so I had plenty to see. I took a small sketchbook, which I used for thumbnails and note taking mostly, as well as the camera for shots like those above. 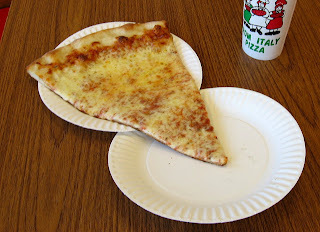 Late lunch was a slice of typical boardwalk pizza (those are standard 9" paper plates underneath it to give you an idea of how big these things are), but I resisted the temptation to get some ice cream. I'm sure I'll be doing more boardwalk visits before this series is done, but today's trip gave me enough information to keep my busy for a while. 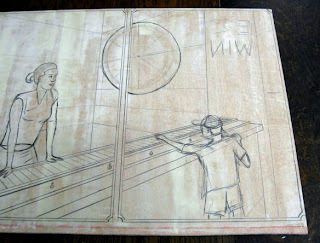 Went back to the Studio today to start drawing on the block itself. I did the basic structure of the game stand first, including the counter top/game board. Then I put the wheel and shelf lines in place (the shelf lines maybe adjusted a little, but the wheel is where it will be). 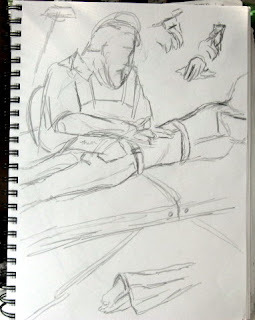 I put in the figure, a reversed and enlarged version on yesterday's sketch. It's a good start. 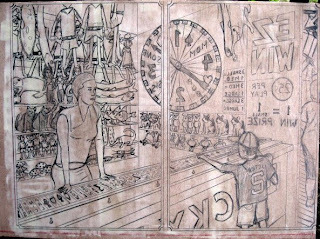 I think I will add another figure, a child on the viewer's side of the counter in the right side panel. Toys for the back wall display and wall graphics are yet to be determined.